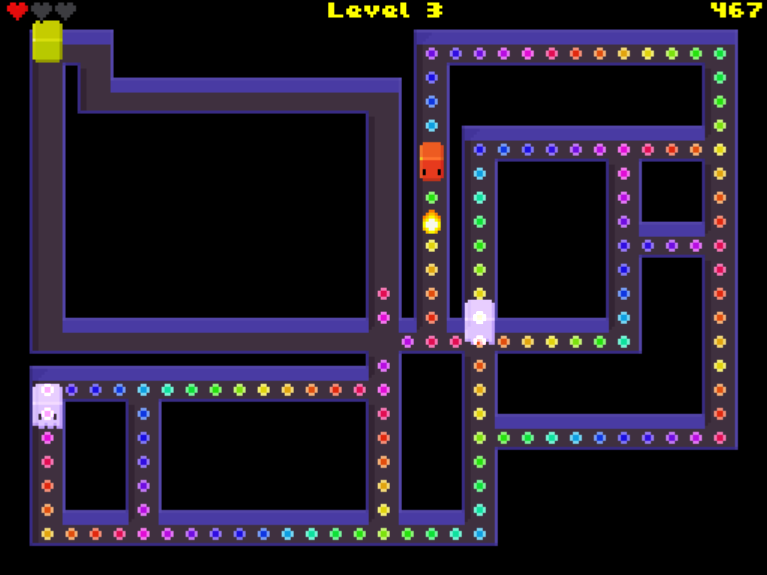 This classic approach is underpinned by a really cool chiptune soundtrack with some generative music that chimes in when dots are being consumed; I found this really connected me to the gameplay and was an integral part of the Chompston experience. There's more to it, though - the creator states that "all the sound effects are played in time and in key with the background soundtrack." I love to see game designers doing more with music in non-music centered games - and contralogic has found a method here to connect the music with the gameplay in a seamless and fun way. To top it all off, stages are procedurally generated, meaning the game won't ever be the same twice. With a tight and classic control scheme, familiar gameplay elements, a novel music system, and randomized level structures, there's no reason anyone should pass on giving Chompston a try. While it may not hold players captive for long, it's sure to put a lot of smiles on a lot of faces... and it's free. Chompston is a fantastic little game that immediately poses the question "why hasn't this been done before"? The mix of Bomberman and Pac-Man combined with procedurally generated levels and audio that is sequenced to the gameplay are all concepts that deserve to be applauded. Most importantly, putting clever design aside, it's also hugely fun to play. 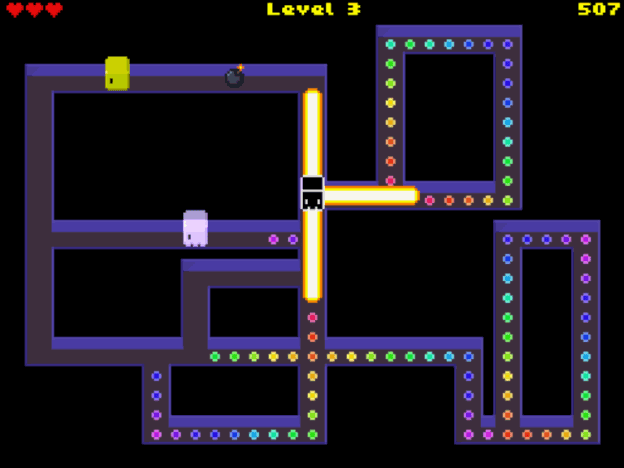 However, despite this Chomspton still comes across as a proof of concept or prototype rather than a full game, as was also the case with their 2011 release Riesling. The in-game graphics are lovely, but the title screen is a little rough around the edges and noticeably static, feeling more like a place holder image than a finished piece of art. I'd also suggest that this is a game screaming out for additional game modes; with its Bomberman roots a co-op or competitive multi-player option would be extremely fun. Likewise, a greater variety of enemies and power-ups would increase its lasting appeal. 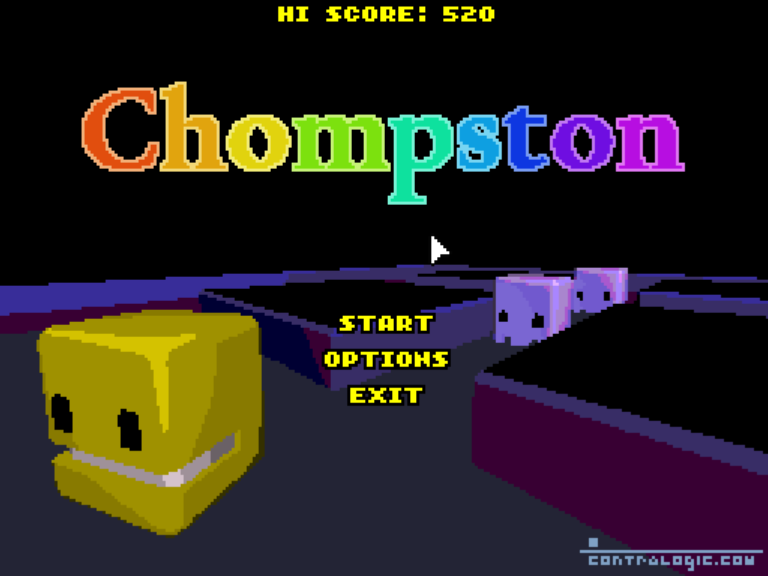 Don't let this put you off though - Chompston in it's current form is a great little coffee break game. I can only hope that contralogic considers investing some more time in developing the game further so that it reaches its full potential. Great Stuff!, There is another mix of Pac-man and Bomberman, an Amiga PD Game called "Bomb-Pac", there is a Screenshot in this forum.